GameStop Run campaign to raise cash for your local club! Global gaming experts, GameStop, have launched exciting trade deals for the summer months, encouraging gamers to trade in their used consoles, games and accessories for cash. Working with local sports clubs, GameStop hope to raise funds for clubs in local communities. Customers can bring their items to GameStop here in City Square to find out the cash value, or check the GameStop website for the latest value offers. Traders could receive €130 for a used PS4 (500G), €30 for an Xbox One controller and anywhere up to €42 for games, such as God of War for example. GameStop will be working with local sports clubs across Ireland to encourage player ambassadors to carry out gaming trade drives at their club to gather up as many unwanted gaming devices as possible to trade in for cash at GameStop. The ambassador will then receive the money to put towards the club, for new equipment, uniforms etc. 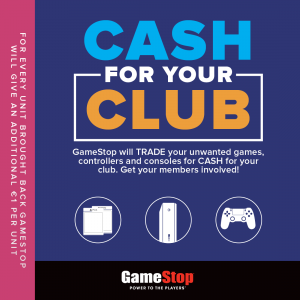 GameStop will add an additional euro for your club for every unit traded in! Thomas Mallon, Marketing Manager for GameStop Norther Europe, said “Trade deals are the life blood of GameStop, and across Ireland clubs are the life blood of our communities. We want to encourage our customers to clear out their old games and consoles by trading them in for cash for their local club. By boosting every unit traded in it’s a great opportunity for our customers to raise funds in their community. While we will see the most take up from sports clubs from GAA, Soccer and Rugby, we would encourage any club to use the opportunity to raise funds. For more information on trade in deals please visit www.gamestop.ie or follow GameStop Ireland at www.facebook.com/GameStopIreland. For those interested in becoming a club ambassador and raising funds for their local sports club and Make-A-Wish foundation please contact your local GameStop for a starter kit. The Sports club activity will end on August 28th 2018.